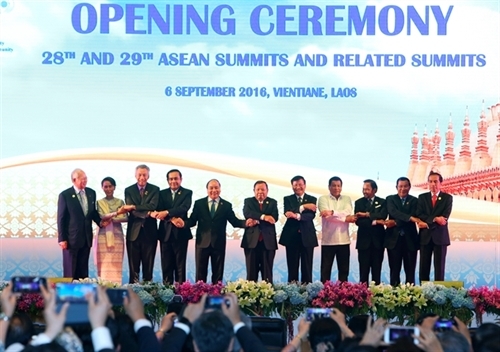 In a speech delivered to the plenary session of the 28th ASEAN Summit - which opened in Laos on September 6 - Prime Minister Nguyen Xuan Phuc urged ASEAN member states to strengthen consultations and raise a common voice on regional issues directly impacting regional security and development. The Prime Minister underscored the need to enhance ASEAN’s capacity and self-reliance and to uphold the bloc’s central role. In addition, he urged the summit to identify priorities towards the implementation of the ASEAN Vision 2025 and action plans for each pillar. On the political-security pillar, ASEAN needs to promote trust-building activities, preventive diplomatic measures, ASEAN’s code of conduct, and law abidance - especially the 1982 United Nations Convention on the Law of the Sea. Together, he said, ASEAN nations can contribute to peace and security by working closely together to prevent conflict risks in the region and to cope with non-traditional security challenges, particularly terrorism and cyber security. In the economic field, priority should be given to facilitating trade, improving the business and investment climate, developing small- and medium-sized enterprises in added value and technological sectors, increasing coordination in macro-economic supervision and financial-monetary stability, he said. The government leader called to intensify cultural exchange, personnel training, environmental protection, climate change response, and disaster control. On bolstering connectivity and narrowing the development gap, he suggested developing road and railway networks, improving maritime and aviation capabilities, and bolstering the integration capacity of Cambodia, Laos, Myanmar and Vietnam. Toward the 50th founding anniversary of ASEAN next year, the PM said Vietnam vows to take practical and effective actions to do more for the bloc. At the session, ASEAN leaders stressed the need to retain their unity and improve the efficiency of operating mechanisms in order to bring practical benefits for the bloc’s people. Later, they held dialogues with representatives from the ASEAN Inter-Parliamentary Council, the ASEAN Youth Organization and the ASEAN Business Advisory Council.